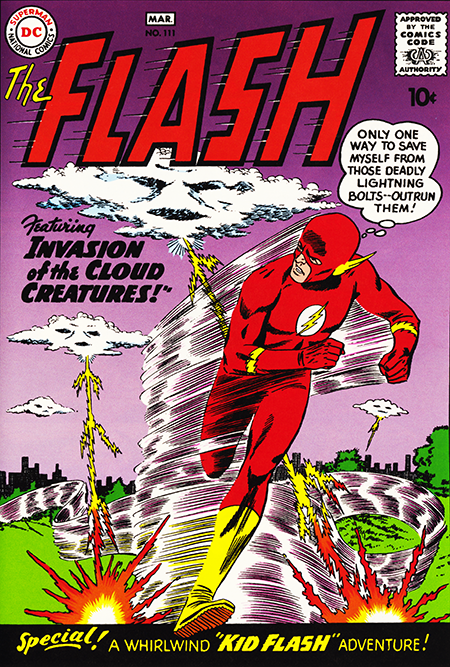 Issue #111’s cover story, The Invasion Of the Cloud Creatures once again featured the masterful inking of Murphy Anderson over Infantino’s ever better pencilling. Let’s just pause a moment to appreciate that. Amen. I actually liked both of the Flash inkers Anderson and Giella and, in fact, Giella’s lighter more angular touch was in many ways better suited to Infantio’s pencilling and to the character. Each issue was a box of chocolates and I enjoyed the variety. Okay, this story takes pseudo science to new heights (pun always intended) as a scientist, Dr. Wiley Summers, encounters some cloud creatures emerging from a volcano. Along with being another civilization from inner Earth, they, of course, want to take over the world. I was willing to ignore this skinny premise simply because the art on the opening pages is so amazing. Personally, I rank it right up there along with Caniff, Sickles, Raymond and Foster… oh, and Crane too. It’s that good. In order to fight these cloud creatures, Broome has the Flash run up a mountain and leap from cloud to cloud punching them in in their highly sensitive nucleus. Apparently clouds can’t take a punch because it works. The more interesting aspect is Dr. Summers himself. He’s intelligent and heroic in his own right and this fact doesn’t go unnoticed by the fickle Iris who is planning to go out on a date with him as the story wraps. As thin as the story is, the art hauls it up a couple of floors and turns it into a nicely entertaining tale. The second story is a Kid Flash story. Although undoubtedly following Julie Schwartz’s instructions to feature the kid hero, rather than have him tag along with the Flash, the story is set in Wally West’s hometown of Blue Valley (I would one day use the town of Blue Valley as a rival school for the Westview Scapegoats in Funky) as the Kid takes on a solo adventure. The stories aren’t that bad in themselves and focus on down-to Earth teen issues rather than alien cloud life forms which now that I think about it maybe wasn’t so bad after all. The most jarring thing is Broome’s unfortunate attempts to be au courant by using current teen slang which he then seeks to explain to us as if embarrassed by the whole idea of it. With the half-life of a Higgs Boson, most slang will never be fresh enough to make it to the printed page without sounding sadly dated and such is the case here. It’s no doubt the reason that even early on in Funky, I chose to eschew using current slang as much as possible. There was a lot of good that I picked up from watching Broome at work, but his attempt to be a hep cool cat wasn’t one of them. I was going to school here and learning my lesson’s.